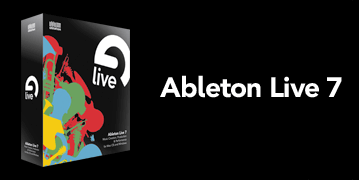 Ableton has updated Live to v7.0.3. 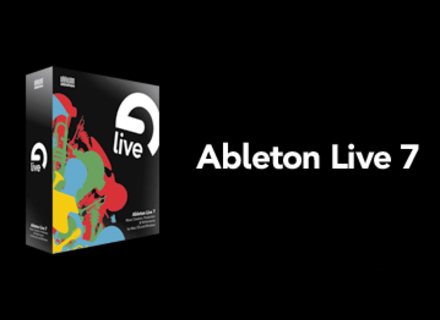 Live 7, General Sequencer from Ableton in the Live 7 series. Two new Lessons: "Compression and Sidechaining" and "Session Drums." Added control surface support for the Akai MPD24. The volumes of tracks 1 to 6 are mapped to the faders. The encoders are mapped to macro controls. The order of the mapping is based on the feedback of this forum poll. Support for dynamic adjustment of the plug-in buffer size for Audio Units. For technical reasons, an Audio Unit device must be instantiated for a buffer size change. Improvements for dialog to set up a Library when starting Live without one. On Mac OS X, Live now supports up to 256 input & output mono channels of the selected audio device. It is now possible to drag a complete folder with presets and/or samples from the Browser onto a Drum Rack's pads. Improve the performance when loading large presets. Support for the Record LED when using the Remote SL as a controller surface. Under certain conditions, the chooser for the Library path would not update properly. The message box saying that the selected Library is not available would not be displayed properly. When Live is running as the MIDI clock master, the first two sent MIDI clock messages could have the same time stamp. An Options.txt entry called '-_Live6ClockOutputCompatibility' brings back the old behavior if required. Analog instrument with unison enabled would always use CPU power even if it was not used. Dropping an instrument on a pad or chain that has devices would not replace the chain. Quitting Live because the expiration date was reached would lead to a crash on Mac OS X 10.5.x. Deleting a track with a Rack in Mapping mode would crash Live. Switching Sampler or Simpler presets during playback could lead to a short but heavy audio signal distortion. When using more than 8 return tracks, the return track volume mixing would not work properly. Under certain conditions, a song loop back jump could lead to a hard disk overload. Starting up Live with a corrupt header template document would lead to a crash. When using particular audio files, Live could crash for certain warp actions. In the inline mixer, resizing a chain would resize all other chains too. When scrubbing behind the loop within a clip, looping would not work properly after the next song start / stop. On Windows, when loading a Rack that contains an AudioUnit (which is disabled on PC), Live would crash when opening or closing Rack chains, or when turning one of the other rack marbles on or off. Installing a content package update could result in an imprecise success message. In ReWire slave mode, sending MIDI data from the master to more than one target within Live could result in audio drop-outs. Freezing of Drum Racks with chain-out routings to the top level would not work properly. Changing the "Block" value in the Spectrum device would cause audio drop-outs. In ReWire slave mode, clips would play from the beginning after rewinding. Under certain conditions, the MIDI handling of VSTs could not work properly. Undoing the creation of a time signature change would crash Live. When installing several packages at once, if one contained a file that already existed and was modified locally, the question whether to replace this file was asked for each pack even when the user answered 'yes to all'. Under certain conditions, a progress bar could display a value greater than 100%. Under certain conditions, default content would not be installed when a certain version of Live would run for the first time. On Mac OS X, changing the Library path to an empty folder would not work properly. Certain texts would not fit into their corresponding button controls. On Windows, Live's main view would not be updated if a certain dialog was in the foreground. Under certain conditions, content packages marked as 'update' would not be automatically installed. Saving a particular device chain as a preset could crash because of an invalid routing. Waves Ltd. GTR Solo Waves announces the GTR Solo – GTR amp simulation in a more affordable package. Drumwerks Nashville Sticks And Brushes Drum Werks Releases Nashville Sticks And Brushes Drum Sample Collection. Acon Digital Media LoopWorx Acon Digital Media has released LoopWorx, a new software application for music production.